This first part discusses a simple setup where only a single table is used for storing user-information. It includes information about how to configure the standard Glassfish jdbcRealm to use the information for authentication and using views to hide database implementaion details. Basically a simple application is secured, enabling only registered users access. I’ve created a small test database in PostgreSQL called testdb, and a datasource has been setup in the appserver named “jdbc/testdb” that accesses the database with the default user/owner as database user. In order to secure the application in the Glassfish server, a security realm has to be configured. When storing users credentials in a database, the jdbcRealm (com.sun.enterprise.security.auth.realm.jdbc.JDBCRealm) could be used. Then we need a table to store our users in. For each user we need at least a user-id (the ID to use when logging in) and a password. If we are going to use this information elsewhere, it makes sense to also store the full name of the user and possibly other information (e.g. email etc.). id The primary key column. I prefer to keep information out of the primary keys, and to have them in as simple datatypes as possible. “serial” is PostgreSQL short for INTEGER where a sequence is used for generating the values automatically. user_id The ID the user must specify when logging in. This must be unique among all users. user_name Some “human-readable” textual representation of the user; possibly full name. md5_password One should never store plain-text passwords in the database. In this sample we use MD5 hashed passwords, readily supported by the SUN JDBCRealm. created Just for keeping track of when the user was created. Should be followed by a similar “updated” column. Now, in order for us to be able to configure the JDBCRealm, we need to specify 2 tables: users and groups and we only have a table for the users. Also, we do not really want to expose the inner workings of our user tables. If we should ever feel like chaning the table structures, we would have to reconfigure the JDBCRealm and possibly other applications as well. The v_user view returns only the user_id and md5_password from the t_user table, just enough information to satisfy the JDBCRealm user table configuration. The v_group view returns the user_id and the hard-coded value “user” for each user defined. Again just enough information to be able to setup the JDBCRealm. Now, this setup might be just a little bit too simple. Maybe we want to be able to distinguish ordinary users from administrators, and we might need a simple way to enable/disable users access without deleting them from the system. The is_admin column is true for administrators. The enabled column is true for all active users. If only a few roles are needed and the setup is never going to be more complex, the “is_admin” column could be changed into a “login_level” column defining different levels of access. The actual mapping between login-levels and groups must be implemented in the v_group view. To test the sectest realm, install the sectest.ear application in your local Glassfish server and hit http://localhost:8080/sectest. 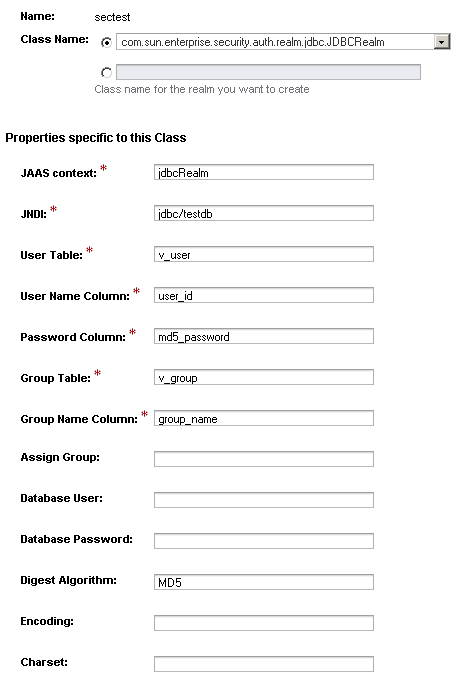 This entry was posted in Databases, Java, Open Source and tagged Glassfish, jee, Postgresql, security. Bookmark the permalink.